Offers plenty to appeal to children and adults, and the clever ending delivers one more treat to pay off the story's tricks. 93 min. Paramount Pictures. Director: Caleb Deschanel. Cast: Griffin O'Neal, Raul Julia, Teri Garr, Joan Hackett, Gabriel Dell (II). 1982 saw the release of two odd and touching tales, both written by Melissa Matheson, of orphaned adolescents dealing with their pain. One was E.T. the Extra-Terrestrial; the other was The Escape Artist, a mostly forgotten sleeper from Francis Ford Coppola's incipient Zoetrope Studios. Matheson and co-writer Stephen Zito adapted The Escape Artist fom David Wagoner's novel of a young teen growing up in the shadow of his legendary but absent escape-artist father. Coppola, who bought the property for himself to direct, eventually passed it to acclaimed cinematographer Caleb Deschanel (The Black Stallion), who made it his directorial debut. The Escape Artist is also the only film to star child actor Griffin O'Neal (better known today for his "gross negligence" conviction in the boating death of Coppola's son Giancarlo). O'Neal charms as the brash Danny Masters, who "escapes" from his grandmother's house to chase his magical legacy. Danny's father was Harry Masters, "second only to Houdini" in his lock-picking escapes. Danny frequently imagines his father, shackled and weighed down in a water chamber, drowning to death, but his magician aunt and uncle (Joan Hackett and former "Bowery Boy" Gabriel Dell) resist broaching the touchy subject with the curious boy. Danny's a prodigy when it comes to prestidigitation, but he may be over his head when it comes to escapes. While scoping out the local magic shop (run by former child-star Jackie Coogan), Danny runs afoul of local tough Stu Quinones (Raul Julia) and his spacey girlfriend Arlene (Teri Garr). Stu, the prodigal son of town mayor Leon Quinones (Desi Arnaz, credited as "Desiderio Arnaz"), makes the mistake of offending Danny. When the boy lifts Stu's wallet, he takes with it incriminating evidence of the mayor's corruption. "This whole town's corrupt," says Danny, who's growing up at an alarming rate. The boy is eager for opportunities—the more dangerous, the better—to prove himself to the world at large and, by extension, his dead father. Primarily, he allows his rivalry with Stu to turn to wary friendship, as the two conspire to upbraid Stu's unloving father. Their plan involves Danny making a great escape in the style of his father, but the last time Danny attempted one of his father's stunts, he nearly drowned. "I guess when you're really good at escapes," Danny says, "you figure you can get away with anything." Before the final fade-out, Danny will have come into his own and learned two important lessons: the terrible secret of his father's death and the reality that adult "tricks" can be deadly business. After The Escape Artist flopped, Deschanel mostly stuck to cinematography (he directed only one other feature, 1989's Crusoe). Naturally, The Escape Artist evinces Deschanel's practiced, poetic eye for the visual image; production designer Dean Tavoularis (The Godfather) contributes and costume designer Gloria Gresham contribute to the film's "out of time" look. The supporting cast includes several familiar faces: David Clennon, M. Emmet Walsh, Huntz Hall, and magician Harry Anderson as Harry Masters. Raul Julia gives the film's world-class performance as the unpredictable Stu. His smoothness perfectly complimenting O'Neal's rake-in-training, Julia tosses off his one-liners with inimitable aplomp (taking long strides across the marble floor of City Hall, he sniffs, "Smells like voters in here"). Julia lends the right touches of menace and overgrown childishness to Stu, a son who has tragically failed to grow out of his father's shadow. If Danny is to survive in the adult world, he must not only contend with men like Stu but avoid becoming one himself. Unjustly overlooked and ripe for rediscovery, The Escape Artist is the sort of smart, PG-rated family entertainment Hollywood so rarely bothers to attempt any more. The unlikely narrative may be too loose-limbed for its own good, but a little imagination will carry viewers through the film's climactic ambiguity (as Stu says, "You've got to expect a little confusion, especially when you're causing it yourself"). 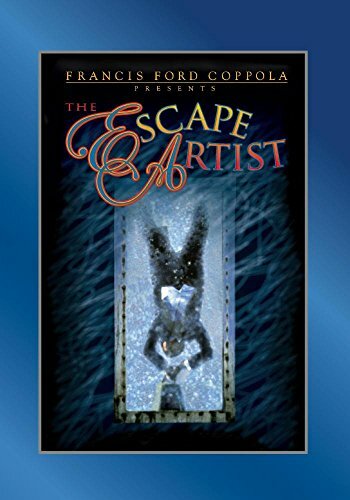 The Escape Artist offers plenty to appeal to children and adults, and the clever ending delivers one more treat to pay off the story's tricks. Our friends at Paramount, bless their hearts, have put out a perfectly lovely special edition of The Escape Artist. The transfer exhibits frame jitter in one scene, but there's not much to distract from the film-like image. A text feature called "Soundtrack Restoration Details" expounds on the challenges of dealing with tracks from the late '70s, when film sound was in transition; these "liner notes" will deepen your appreciation of what Paramount has accomplished with this disc, which beautifully preserves George Delerue's score. The dominant feature, though, is a feature-length commentary by director Caleb Deschanel, Technical Advisor Ricky Jay, and production manager Barrie Osborne. The three explain in detail how the project came to be and the inspirations for and approach to the illusions in the film; they also discuss the unique cast and the collaboration with Coppola in the heady early days of Zoetrope. All site content © 2000-2019 Peter Canavese. Page generated at 04/24/2019 07:38:18AM.